Alex Cross: Got something for you. Naomi Cross: What happened to the strings? Alex Cross: New strings for new music. This movie is not among the best but still has more to offer than the average thriller. This is mostly due to its cast and fine thriller concept, that however doesn't always gets handled well. Not all plot-lines get handled and wrapped up properly and the movie leaves some loose ends. The movie also picks some not so likely approaches with each story sometimes, which goes at the expensive of the credibility- and therefore also the tension of the movie. It's a movie that had the potential of becoming a real dark and eerie thriller, I mean the concept of the movie would definitely allow this but the movie gets somewhere stuck between its successful and not so successful thriller moments. Guess Morgan Freeman wanted to make another "Se7en" like thriller. 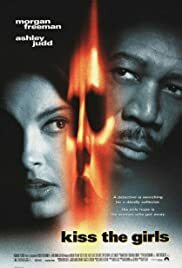 Well, it's not completely fair to compare this movie to "Se7en" but because Morgan Freeman is in it and it's from about the same period, it's easy and tempting to do so. Also with some imagination the plots and approaches of both movies show some similarities. But unfortunately "Kiss the Girls" is nowhere in the same league as "Se7en" but fans of the genre will still find plenty to enjoy in this movie. The movie features all of the right required thriller ingredients. So a psychopath, a cop trying to solve the case and of course a couple of plot twists. It also has all the right looks for a thriller. The movie has the right sort of dark undertone and handles some of its moments effectively. The movie truly benefits from its cast. Morgan Freeman is an experienced actor and always good in these sort of roles. The movie also among other features; Ashley Judd, Cary Elwes, Bill Nunn, Brian Cox and Jeremy Piven. A better than average thriller.